Tom Crisham's practice focuses on complex commercial litigation, including professional liability, insurance coverage, product liability, and transportation and construction law. He is a Fellow of the American College of Trial Lawyers and of the International Society of Barristers, and is an Advocate of the American Board of Trial Advocates. 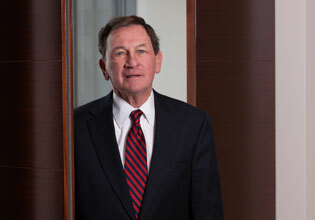 He has served as President and Chairman of the Board of the Defense Research and Trial Lawyers Institute (DRI), a national association for civil trial lawyers. Tom is also a prolific author and lecturer, with numerous textbooks, seminars and published papers to his credit on a wide range of legal topics, including litigation tactics, product liability, insurance coverage and professional liability issues. In addition to the practice of law, Tom is also a popular and highly sought-after professor and lecturer in academic circles, having served on adjunct faculties of Northwestern University School of Law, Loyola University Chicago School of Law, and The John Marshall Law School.